Changchun “Chad” Zeng with Florida State University’s High Performance Materials Institute (HPMI). Whether it’s a football helmet, hospital bed, knee pad or body armor, the foam it contains plays a critical role in making that product both comfortable and safe. But can that foam be transformed into something significantly better, safer and more comfortable? 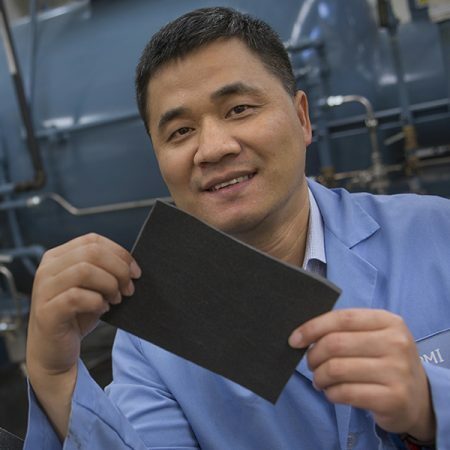 Changchun “Chad” Zeng with Florida State University’s High Performance Materials Institute (HPMI) says yes, and his brand new, high-performing auxetic foam is proving the point as it heads to the marketplace through a license agreement with Auxadyne LLC. Part of what makes Zeng’s auxetic foam truly unique is its ability to get thicker, rather than thinner, when stretched. In practical terms, this counter-intuitive behavior, totally opposite to that of conventional foam, leads to many enhanced materials properties including a better and more comfortable fit that adjusts on the fly. Zeng’s auxetic foam has its roots in a multiyear, multimillion dollar project with the U.S. Department of Veterans Affairs. The VA Innovation Initiative project was aimed at addressing the shortcomings of current prosthetic socket systems through the development, testing and delivery of “Socket Optimized for Comfort with Advanced Technology” (SOCAT) prototypes. The sports equipment industry in particular could take advantage of the new foam technology to improve the impact absorption and overall comfort of the different protective gear that athletes must wear, Condon said. Condon anticipates an immediate benefit to the medical device and protective equipment industries while the collaborative project for the development of the new prosthetic sock is underway. “It’s hard not to get excited when you think of all the good this technology can do for people,” Condon said.